An ADO.NET profiler, capable of profiling calls on raw ADO.NET (SQL Server, Oracle, etc), LINQ-to-SQL, Entity Framework (including Code First and EF Core), and a range of other data access scenarios. A pragmatic Step instrumentation that you can add to code you want to explicitly profile. MiniProfiler for .NET supports both .NET Full Framework and .NET Core. The project lives on GitHub here and documentation and getting started are here. The MiniProfiler for Ruby project lives on GitHub here. For Ruby documentation, see GitHub and Sams blog post. 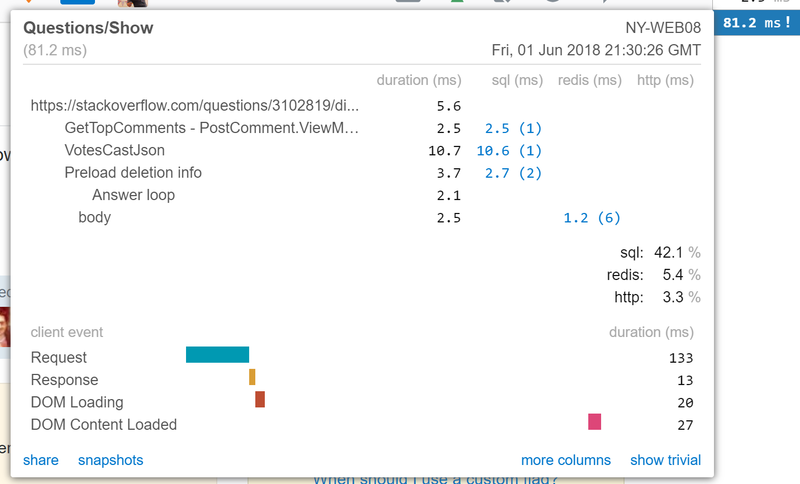 Discussion and KB live at community.miniprofiler.com or on Stack Overflow. View releases and feel free to submit Pull Requests and Issues on GitHub.